The assassinated heir to the Austrian throne, Archduke Franz Ferdinand, and his wife Sophie were interred into the crypt at Artstetten Castle on July 4, 1914. 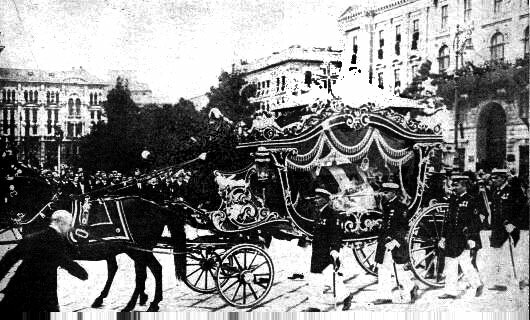 Following their deaths in Sarajevo on June 28, the Austrian Imperial Court arranged for the couple’s bodies to be transported by the battleship SMS Viribus Unitis to Trieste, Italy on June 30, before their final journey to Vienna was undertaken by train. Franz Ferdinand and Sophie’s funeral services, held at the Court Chapel of Hofburg Palace on July 3 and at Artstetten Castle on July 4, were held as private affairs for members of the Imperial Family (a public viewing of the bodies in the morning of July 3 was kept to four hours only). This was despite members of Europe’s royal families, namely Kaiser Wilhelm II of Germany, announcing their attendance – the Court disinvited them all. The couple’s three children – Sophie, Maximilian and Ernst – were not present at the service at the Hofburg, but were brought to the chapel later that evening accompanied by their aunt, the Princess von Thun und Hohenstein, to view the coffins. The requiem mass held at Artstetten was attended by the new heir to the throne, Archduke Karl, and other members of the Imperial Family. The Archduke and the Duchess were interred here because Sophie was unable to be interred into the Imperial Crypt at Capuchin Church in Vienna, as she was not considered a true member of the Imperial Family (she and Franz Ferdinand had a morganatic marriage). The castle was the family’s summer home, and today is private property of the Hohenbergs, the direct descendants of Franz Ferdinand and Sophie. Tagged Anniversary, Archduke Franz Ferdinand of Austria, Artstetten Castle, Funeral, House of Habsburg, Sophie Duchess of Hohenberg.